MAY DAY MAY DAY. 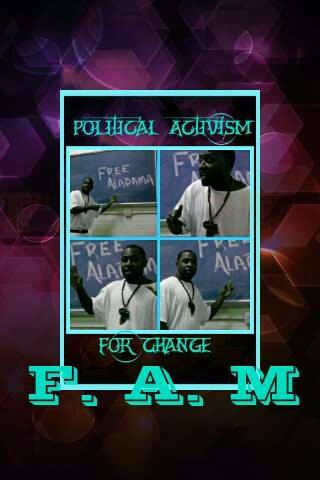 ..
WE, the Prisoners of Alabama Department of Corrections, as a collective reach out to Rev. Kenneth Glasgow, Founder of The Ordinary People Society, Prodigal Child Project and Formerly Incarcerated Convicted People Families Movement asking that Rev. Glasgow mediate and speak on our behalf, in making the following statement to the Legislators of the state of Alabama. 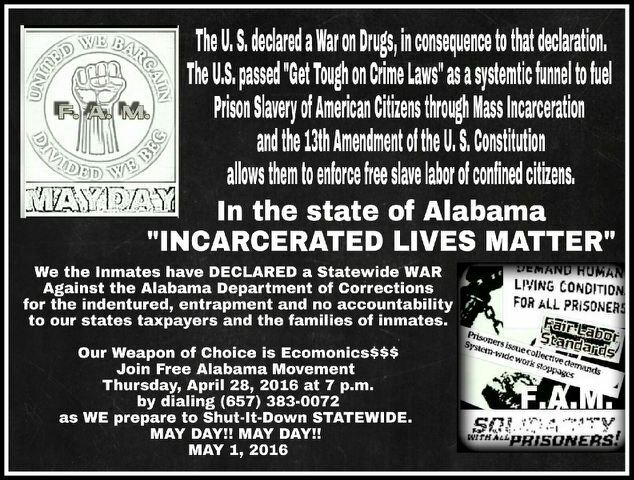 At 12:01 May 1, 2016 We, Alabama Prisoners will begin a Peaceful and Nonviolent Protest for Our Human Rights in the form of a Work Stoppage. This is in fact a means to Peacefully Petition the Alabama Government for Redress of Grievances as We have suffered under Cruel and Inhumane Conditions over the past two decades. Let us be clear, this is not just about the Deplorable Conditions of Confinement, but more so about the 13th Amendment, the Alabama Constitution of 1901 and the Statutory Laws discriminatoryly enacted from both. The laws that created and maintains the denial of our Human Rights and perpetuation of our Economical Exploitation. From Wrongful Convictions, Exceedingly Excessive and Mandatory LWOP sentences, Alabama’s prisons are literally Warehouses of Men stacked on top of one another, and due to an Arbitrary and Biased Parole Board System, thousands of Men eligible to be released are stopped up in a broken and dangerous system. 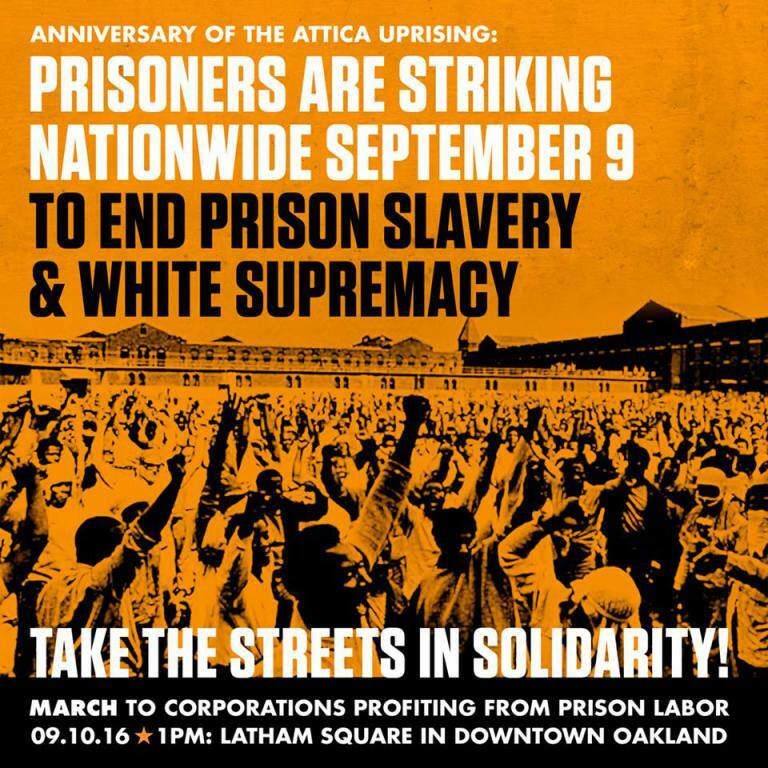 *It has been stated and acknowledged that there are over 3, 000 people that are eligible to be released. However, due to budgetary concerns (parole and probation officers, supervision, etc) they remain trapped in an excessively overcrowded system; exposed to unnecessary threat to their safety and well being. To address this issue would contribute greatly to relieving the pressure of prison overcrowding. A lot of the pressure could be released by Revising and Modifying the Laws and Policies that Created and Perpetuates these Cruel and Inhumane Conditions; not by building bigger more expensive prisons. *Over 8000 people are serving enhanced mandatory sentences under Alabama’s Habitual Offenders Statute. More than 2000 are serving Mandatory LWOP sentence, some for petty theft cases. To Repeal the Habitual Offenders Statute would create the opportunity for over 8000 people to be eligible to return to their families and communities after decades due to the application of the Habitual Offenders Statute while reducing the inhumane and dangerous overcrowding which contributes to the spread of diseases and increases the level of violence. Overall it would contribute to a more sanitary and humane living environment. *From exposure through exonerations it is clear that the Prosecutors of the State of Alabama are more concerned with convictions than truth and innocence. Most of the attention has been focused on the Wrongful Convictions of those sentenced to Death. As a result a demand for oversight was expressed in Senate Bill 237. However, through political maneuvering this Bill was tailored to only apply to those sentenced to death. We assert that The Alabama Innocence Inquiry Commission created by Senate Bill 237 shall apply to all Wrongfully Convicted prisoners not just Death Penalty cases. To be Wrongfully Convicted is to be Wrongfully Convicted no matter the sentence. No innocent person should suffer the loss of his freedom unjustly and remain confined due to procedural limitations or judicial misconduct. Therefore, this Bill shall apply to all prisoners with credible claims of innocence, as this is what justice requires. *Earlier this year, the U.S. Supreme rightly declared that mandatory Life without Parole sentences for juveniles was unconstitutional. It is time that Alabama go a step further and abolish mandatory Life without Parole sentences for First Time Offenders, many who were barely beyond the juvenile age limit. This would make hundreds of prisoners eligible to earn their freedom after being provided Education, Rehabilitation and ReEntry Preparedness. Thus also relieving some of the pressure and strain created by the excessive overcrowding. 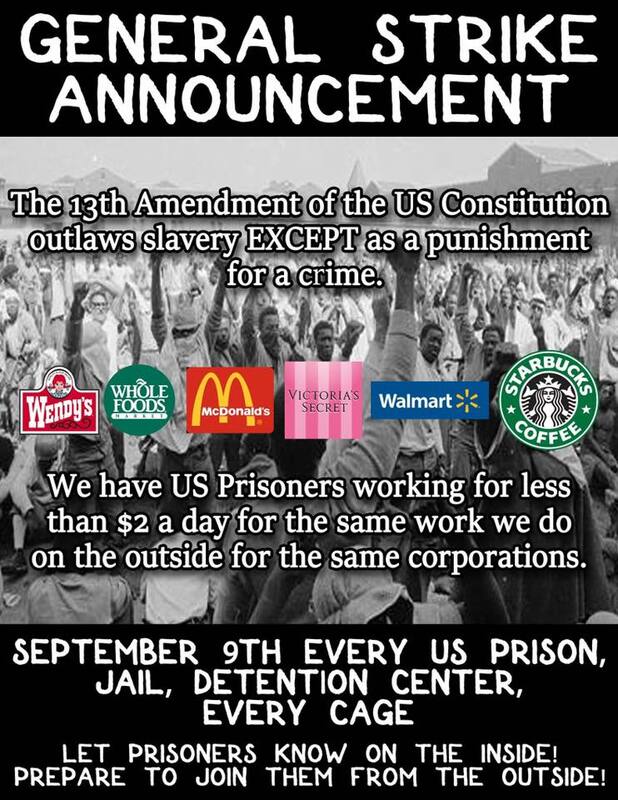 *We further state that the A.D.O.C’s Economical policies and practices of compelling Incarcerated Citizens to provide labor with no compensation, while imposing various fines and fees upon them, is hyper-exploitative, unjust and amounts to PRISON SLAVERY.—–It is discriminatory and exploitative to force Incarcerated people to work while prohibiting them from being compensated; yet imposing arbitrary fines and fees upon them. To work is an essential part of rehabilitation and learning to be responsible for self, as from the compensation one is able to provide for their needs and ease the financial burden on their families. Therefore, A.D.O.C’s Economical policy of Free Labor is counterproductive to rehabilitation and is exploitative and demeaning. Therefore, a more equitable Economic Policy shall be established between Alabama Prisoners and the ADOC. *The Alabama Parole Board is arbitrary and biased therefore it must be overhauled to establish a criteria for those eligible for Parole. The members of the Alabama parole board are receiving these appointments with an agenda that says that rewards them with long-term employment and other incentives to deny parole. These members refuse to set criteria for parole eligibility because this would make parole mandatory, instead of discretionary, for those who qualify. In keeping with the sentiments of John B. Knox, the State of Alabama has used the Constitution of 1901 to construct a solid foundation, in which to discriminate from. Even to this day, Alabama openly applies its laws discriminately, first –based upon race, then upon financial status. Alabama’s “good old boy”-style of justice is maintained and perpetuated by police officers “overreaching”, district attorney’s ” overcharging” and judges “over sentencing.” All of this is made possible by the Alabama Constitution of 1901 and the Alabama Legislature, as it is the Alabama Legislature that enact these laws that specifically target young African-American males, particularly and African-Americans in general. *One glaring example, is the racially motivated amending of the Capital Murder statute to include Section 16, 17 and 18- or commonly called the “drive-by shooting laws”. According to the Alabama Legislature, in the early 1990’s there was a massive public outcry against”gangs”, so in 1992 the Legislature passed Act 92-601; which made a murder committed by the use of a deadly weapon fired from or into a vehicle, a Capital Offense–punishable by death or life without parole. Act 92-601 became codified in Title 13A-5-40(a)(16),(17) and (18). From a plain reading of the statute, in order to be charged and found guilty of the Capital Offense, all that’s required is that the shooter or victim be in a vehicle or house at the time of the murder. Prior to this amendment, all Capital Offenses required an aggravating circumstance in order to elevate the murder to a death penalty offense. However, the “drive-by shooting laws” are simply based upon location of the shooter or victim. On March 28, 2006, this Bill was adopted by the House of Representatives. On April 17, 2006, this Bill Was adopted and signed by the Senate. Upon both Houses adopting this Bill, it became House Joint Resolution 575. In accordance with the procedure for passing a Bill into Law, the House Joint Resolution was delivered to the Governor. On April 27, 2006 at 1:09 p.m. Governor Bob Riley signed the Bill. In HJR 575 (Act No. 2006-642) the legislature recognized that Section 13A-5-40(a)(17),(18) has been misinterpreted by prosecutors and courts to apply to any murder committed by or through the use of a deadly weapon, fired or otherwise used within or from a vehicle, even if it was not gang related. Being that this interpretation was contrary to the legislature’s intent, the Legislature urged the Attorney General and District Attorneys to charge only those individuals who commit murder by or through the use of a deadly weapon fired or otherwise within or from a vehicle, when the vehicle was involved in the shooting or that the shooting was gang related. This clarification by the legislature should have changed the sentences for countless individuals serving Life Without Parole behind the prosecutors and judges misapplication of the law. Therefore, the Legislature shall amend the “drive-by shooting” statutes, so that the plain language of the statute will effectuate the legislature’s intent as expressed in House Joint Resolution 575(Act No. 2006-642). And to make such Amendment Retroactive. *The A.D.O.C’s policy and practice of not affording those Incarcerated with meaningful Educational and Rehabilitation opportunities falls below the standards of human decency, as it perpetuates ignorance and exploitation. It has been empirically proven that the lack of Education is a primary driver for incarceration, therefore, Rehabilitation has to include a meaningful opportunity for Education programs. (Springville, Ala.) – Demanding an end to the filthy living conditions on Alabama’s death row and “a culture of violence” carried out by officials throughout the state’s maximum security prisons, families and friends of the men, women and children who are incarcerated in Alabama prisons will hold a peaceful protest on Sunday, Feb. 1. 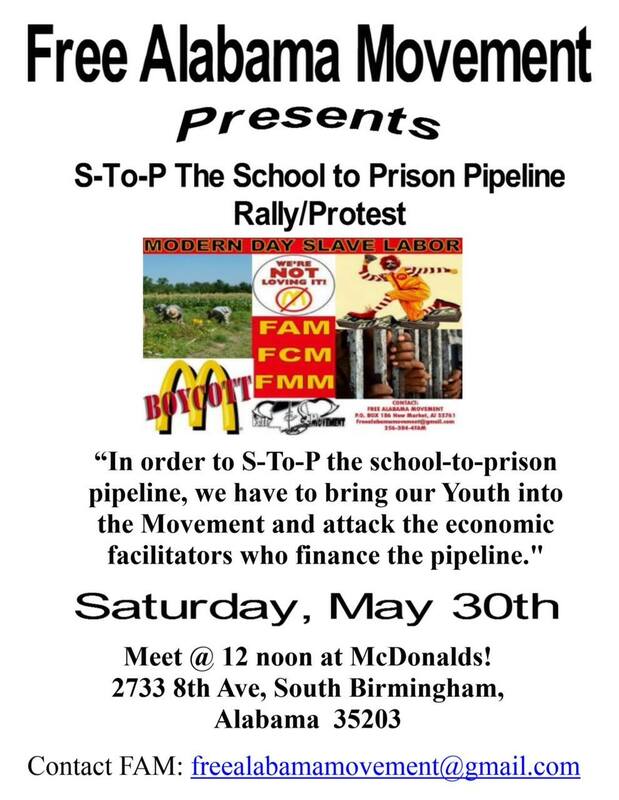 Sponsored by the Free Alabama Movement (FAM), the protest will begin at 11:30 a.m.in front of the St. Clair Correctional Facility (SCCF), located at 1000 St. Clair Road in Springville. 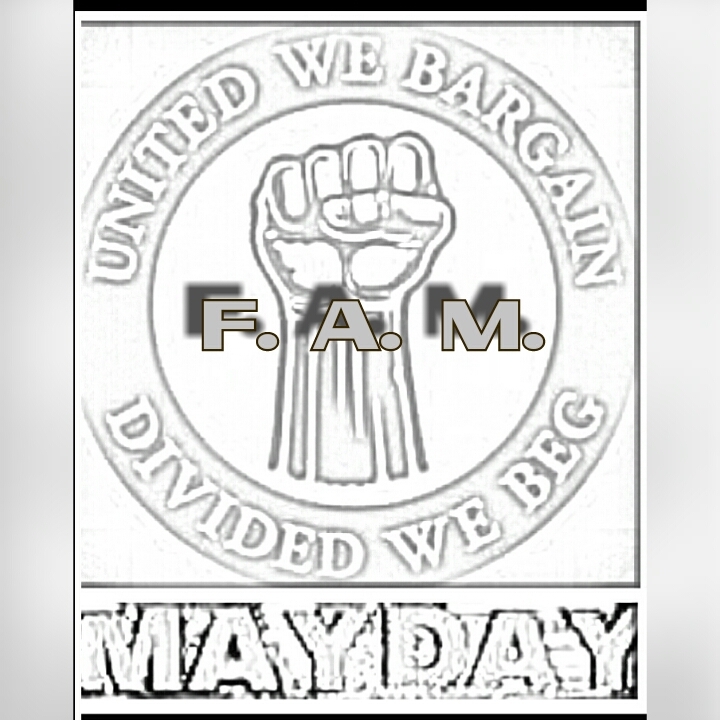 FAM was started by men in Alabama state prisons to expose “the deplorable conditions and the slave labor inside the cement walls” of the state’s prisons. FAM has posted videos on You Tube in which over 80 men who are incarcerated in the Alabama Department of Corrections give their personal accounts about the inhumane living conditions they endure in Alabama prisons. Three Alabama maximum security prisons, St. Clair CF, Holman Correctional Facility, and Donaldson Correctional Facility, all went on lockdown at some point in the past 10 days due to violent-related incidents. and friends cannot visit them. a day. “We are human beings. Just because we’re on death row doesn’t mean that we have to live like animals,” said one death row inmate. The guards used pepper spray to punish the peaceful protesters in the segregation unit at Holman who were also protesting the inhumane living conditions. 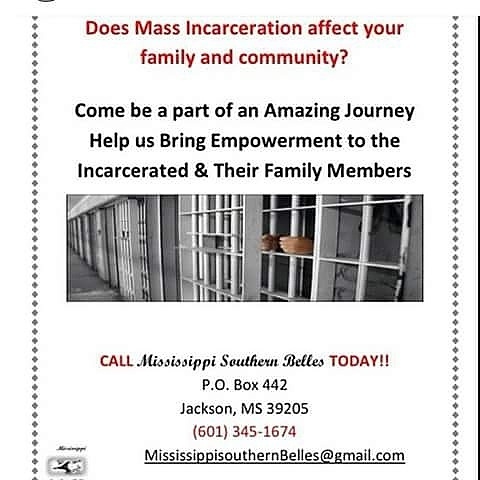 SCCF has turned into one of the most dangerous prisons in America, according to the FAM. The prison’s warden, Carter Davenport was previously suspended in 2012 for assaulting a man confined at St. Clair in the head while he was handcuffed. Riot police have been called in at SCCF, according to FAM. In the last two weeks, there have been at least 20 incidents in which people were stabbed or assaulted by an officer, at SCCF. Prisoner Jarvis “Flame” Jenkins was beaten twice by guards and was seen with blood dripping from his clothes. Another SCCF prisoner, Derrick LaKeith Brown, has been hospitalized with injuries for a week. Prison officials Warden Walter Myers and Captain Darryl Fails, and others, removed James Pleasant from his cell at Holman on January 23, 2015, and told him that he, Robert E. Council (Holman) and Melvin Ray (St. Clair), known as the FAM 3, were problems to the ADOC and threatened to kill them for exposing inhumane and illegal conditions inside Alabama prisons. FAM has been organizing Non-Violent and Peaceful Protests throughout the ADOC since January 1, 2015, when over a three week perios, over 4500 men participated in the demonstrated, which were supported by their families, friends, loved ones, and supporters nationwide. For more information, call Ann Brooks at (256)783-1044. UPDATED: On January 27, 2015, St. Clair CF went back on lockdown, where the overcrowding and lack of leadership from Warden Carter Davenport continues to cause a violent atmosphere. Today in America, there’s the resurgence of a People’s Movement sweeping across the Nation — As the flame of inhumane treatment and economical exploitation has billowed into a wildfire demanding change. Reminiscent of the Civil Rights Movement of the 60’s, from California to Ohio, Texas to Florida, there is a deafening call for an end to America’s systemized targeting, mass incarcerating, warehousing, then economically exploiting those considered, “LOW CLASS,” i.e., New African, Hispanic and poor whites. Suffering from gross incompetence, sub-par management of resources and the Nation’s highest OVERCROWDING RATIO – 200% over its designed capacity-that flame of change touched the Alabama Prison system. On Jan. 1, 2014, FREE ALABAMA MOVEMNET launched a cross-racial collective action – a PEACEFUL & NON VIOLENT PROTEST for Human & Civil Rights, in the form of a work stoppage, which spread to St. Clair Corr. Fac. on Jan. 3, 2014 and Elmore Corr. Fac. on Jan. 5, 2014. 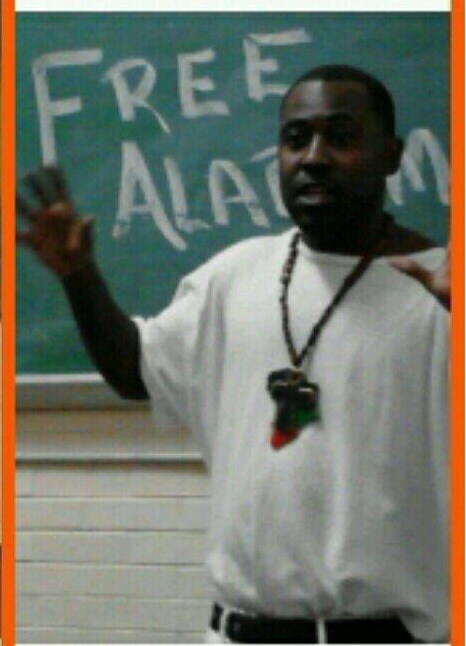 Free Alabama Movement is an “INSIDE-OUTSIDE” solidarity network, which has brought Alabama Prison Class and Human Rights Advocacy Groups together across Racial, Ideological and Geographic differences – thereby created a cross-denominational solidarity, unlike anything ever seen in the Alabama Prison System. 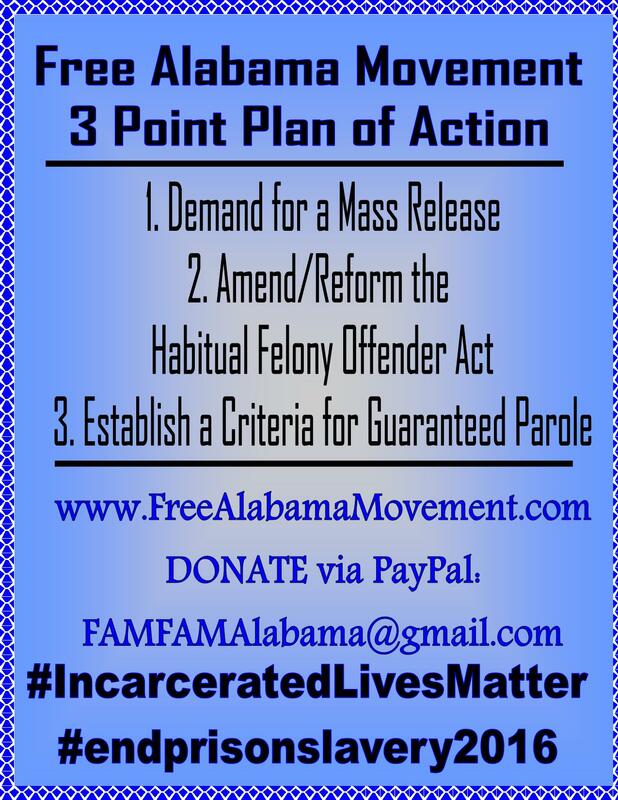 Free Alabama Movement is a peaceful & nonviolent protest for the human and civil rights of over 27,000 incarcerated citizens and several more thousands of family & friends of those incarcerated citizens. 1. WAREHOUSING INMATES IN OVERCROWDED DORMITORIES…. 2. PROVIDING NO EDUCATIONAL OR REHABILITATIONAL PROGRAMS…. 1) Overcrowding MUST be addressed: 8-10 Thousand People released. 2) Taxation without compensation (free labor) abolished. 3.) Parole Board overhauled to establish parole criteria. 4.) Abolish Life Without Parole, Life/Barred from Parole & the Death Penalty. 5.) Amend Arbitrary & Discriminatory Applied Laws, i.e. 13A-5-40 (16)(17)(18). In every stage of these inhumane conditions, we have petitioned the courts for redress, in the most humble method-filing lawsuit after lawsuit. Our repeated petitions have been answered with time-stalling rhetoric, as we continue to suffer from neglect while the D.O.C. daily reaps the financial benefits of our economical exploitations. And as of June 2013, Alabama law makers established that prisoners could no longer file “class action” law suits against the D.O.C. in regards to inhumane living conditions. (See AL Prison Litigation Reform Act). inhumane treatment and overcrowded prison conditions, we can’t rely on lawsuits alone – they have to be connected to the larger struggle. FREE ALABAMA MOVEMENT IS THE LARGER STRUGGLE – GET INFORMED!! The numbers support our contention that “MONEY” is the motive and most important factor in explaining the policies and conditions within the D.O.C. Therefore, an economical response is our most effective strategy. We have researched and studied the lessons of previous prison movements throughout the country; and the evidence of the Jan. 1, 2014 – Jan. 21, 2014 work stoppage has confirmed that prisons don’t function without inmate labor. And every day that the prison doesn’t function the prison profit margin plumets. Human Rights. This method also affords us the opportunity to show society that many of us are intelligent & rational men striving to resolve our issues with the most peaceful means possible; and to combat the misconception that we all are, irrational, violent predators lacking any morality and humanity. Alabama’s inhumane treatment and economical exploitations. Maybe that’s what it might take – as Alabama has a long history of having to be forced into glory, by the intervention of the Federal Government. over by the Federal Courts due to inhumane treatment of its prisoners. 40 YEARS LATER, the Alabama prison system is once again on the brink of a possible federal take over. In the 1970’s, the inmates resorted to VIOLENCE in order to push change. 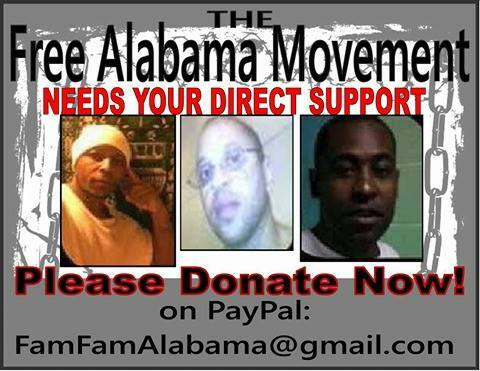 Please donate to Free Alabama Movement via Paypal by clicking on our logo, thank you!